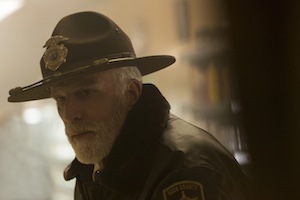 So when he was approached about joining the ’70s-set second season as Sheriff Hank Larsson — the father-in-law of Lou Solverson (played in season 2 by Patrick Wilson; an older version of Lou was portrayed by Keith Carradine in the first season) — Danson jumped at the chance. It helped that Hank is a complicated fellow. Naturally, that will cause complications for the law enforcement. “We’re in the middle of that, trying to protect Kristen and Jesse’s characters [Peggy and Ed] and also keep this violence at arm’s length,” Danson said. And though there is stress in the family and mayhem going on in town, the Hank and Lou partnership should survive.